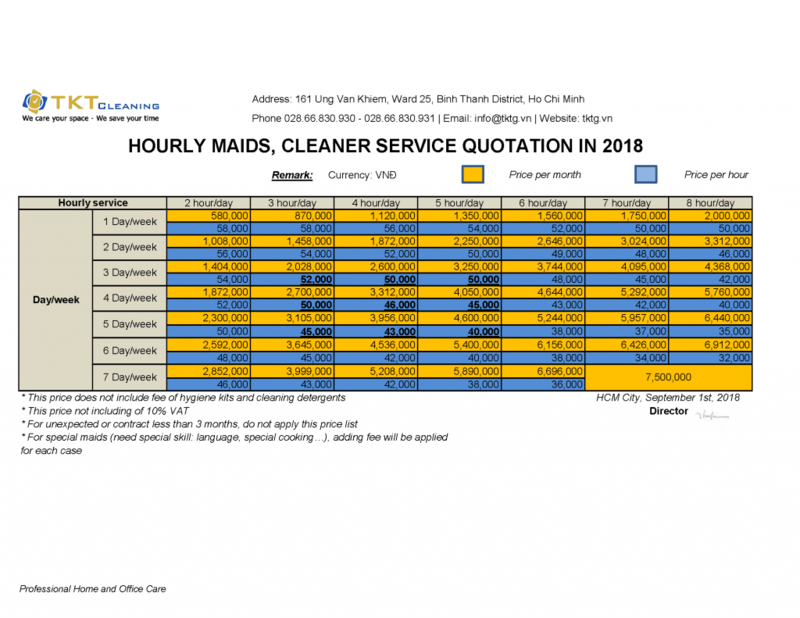 Hourly cleaning maids service of TKT Cleaning in Ho Chi Minh City, Vietnam : Cost Savings – Efficiency – Flexibility and commitment to constantly improve the quality for the benefit of customers. Faced with the difficulties of the economy, you’re a headache to cut, saving the expenses of the business, your company. It is important to keep cleanness of working environment for your company. But have you thought or known forms of cleaning maids hired by the hour? That is a new way, a new trend, more savings, more efficient. With the high appreciation of our partners that provided services by the hour cleaning maids staff that has served TKT Cleaning, we are confident will meet your requirements. This is a new solution, really cost saving and suitable for companies that need to reduce costs in the economic conditions are difficult in Vietnam. Providing cleaning maid: 8, every day … we always have the package solutions for you with best cost. Please contact us, so we have the opportunity to meet, consult and quote to you the best office cleaning services prices. Hourly cleaning service can also include package: hourly cleaning staff, equipment and specialty chemicals for the entire public area of the building, or, depending on the specific location of each area. Job frequency can be daily, weekly, monthly …. Ground floor: main entrance, reception area, main lobby, lobby, elevators, pantry, guest toilet. Efficient: Provides the optimal solution based on the requirements and business characteristics of the customers with reasonable prices. We are useful office business cleaning services. Flexibility: Meeting the diverse needs of customers, quickly settle customer complaints, Continuously improving service quality. We believe that we will meet the highest requirements of our customers.